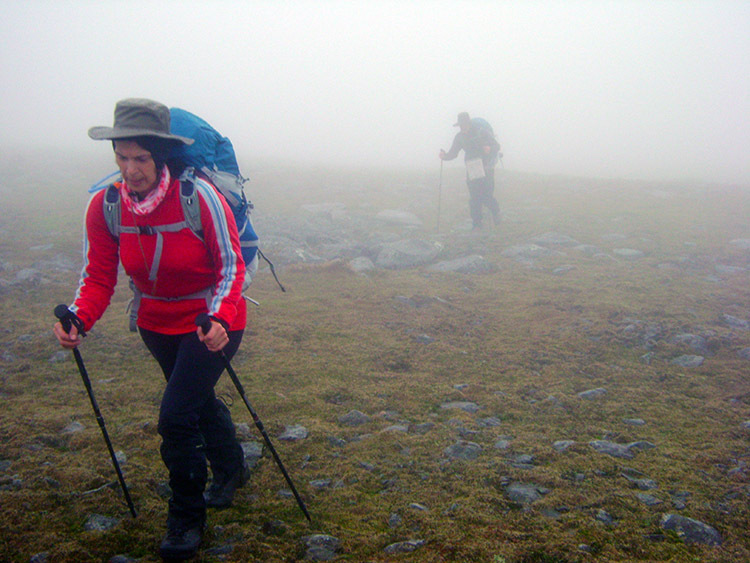 Summary: This twelve mile walk is a tough undertaking. 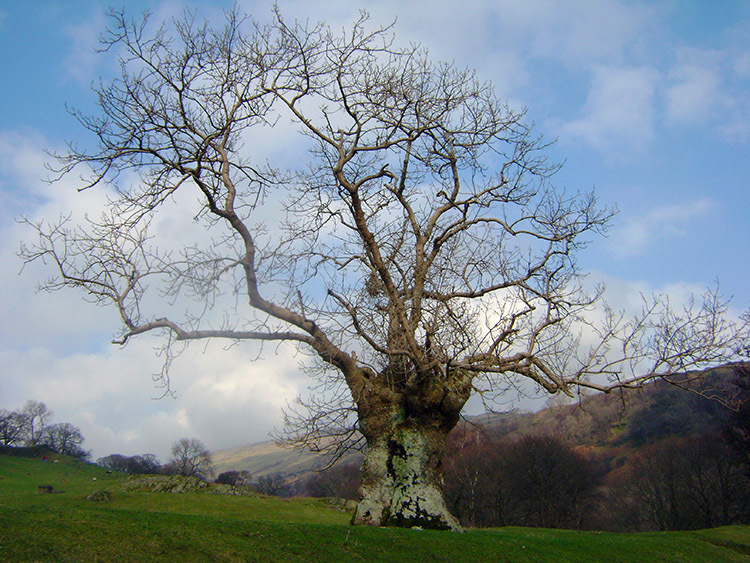 Starting from Wythburn near Thirlmere the route takes us to seven of Alfred Wainwrights Lakeland Fells. This could have been eight with a short detour north to Helvellyn but as I had been on Helvellyn recently we chose not to detour. 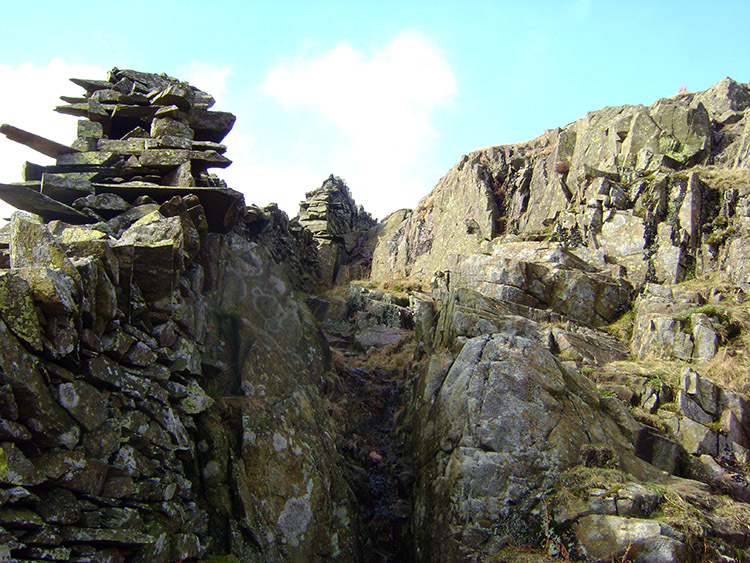 The first three miles is the toughest, a continuous climb from Wythburn to Nethermost Pike but once that is done only short hauls to Seat Sandal and Fairfield remain. The rest of the walk is a high level Lakeland ridge spectacular. This was not the best of days to be taking a walk to the high fells of Cumbria. Despite promises of good weather later in the day we were starting early; we being me, John Lister, Joanne Lister and John Deasey. John Lister and wife Joanne were laden with backpacks carrying the full weight they would be carrying to Patagonia the following week. John Deasey and I were with much lighter loads. The early start?.. it was Friday and none of us fancied journeys home too late in the day in competition with Friday afternoon commuters. Anyway, off we went into a drizzly start to the walk full of expectation that the forecasters had it right and we would be bathed in sunshine by lunch. Immediately into a significant climb we had shelter in the small Wythburn Forest for the first half mile before we emerged onto the open fells by Comb Gill. 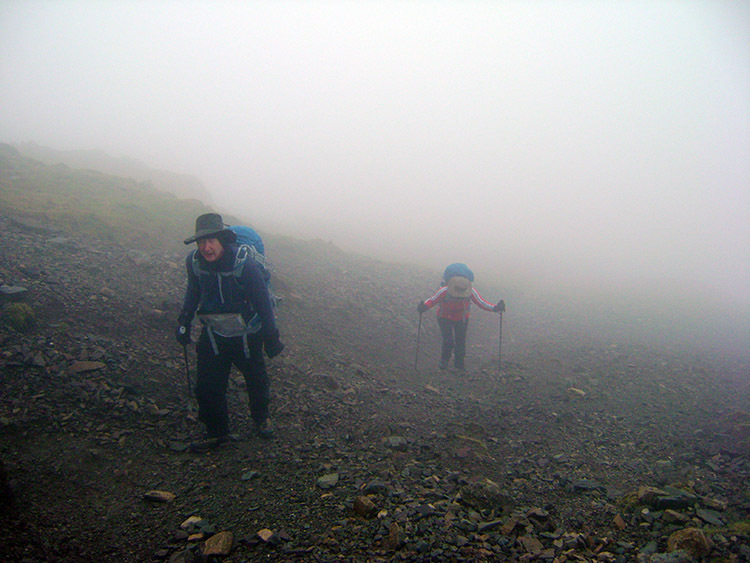 We climbed steadily on, there was not much to stop for, apart from the immediate local views all we could see was cloud. 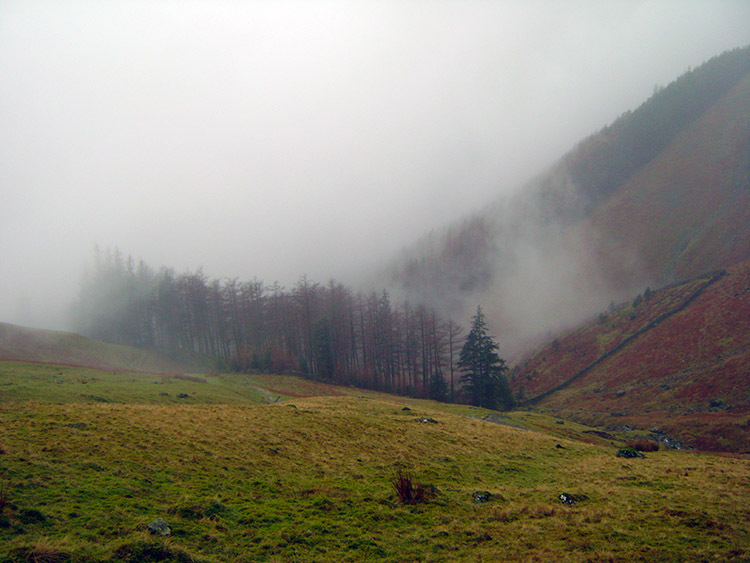 As we climbed further up the fell side I paused to look back down toward the forest plantation. Plumes of evaporating mist were on the rise and the shifting shapes captured my imagination for a short while. Then I continued on, often taking to John Deasey as we were walking together for the first time after more than a year of getting to know each other on-line. We talked about our shared love of walking and of music with 70's prog rock a particular genre we both identified with. The discussion saw off a few miles of ascent, before we knew it we had passed Birk Side in which we had got through an hours hard work, made over two miles distance and 500 metres of ascent. We continued on in good spirit to High Crags. Soon after High Crags we reached the domed top of Nethermost Pike, a contradiction in terms that Alfred Wainwright noted in his pictorial guide to the fell. 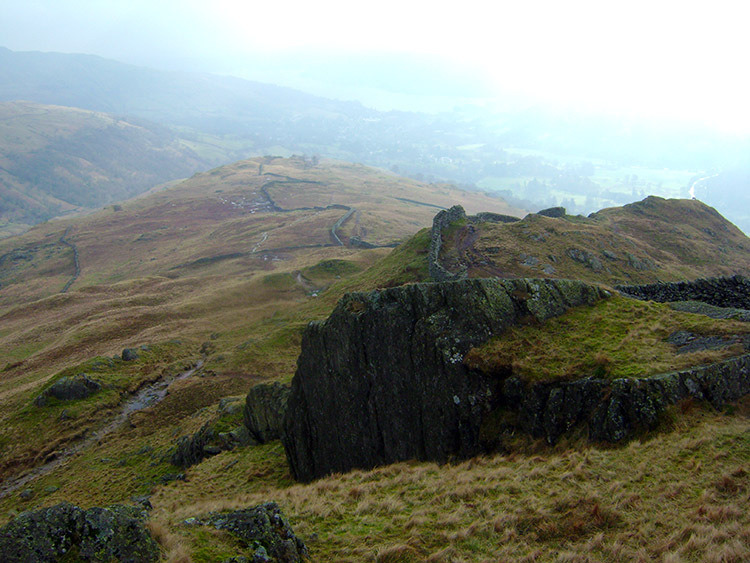 He wrote "The summit is of considerable extent and so remarkably flat that it is not easy to understand why the name 'Pike' was given to the fell". 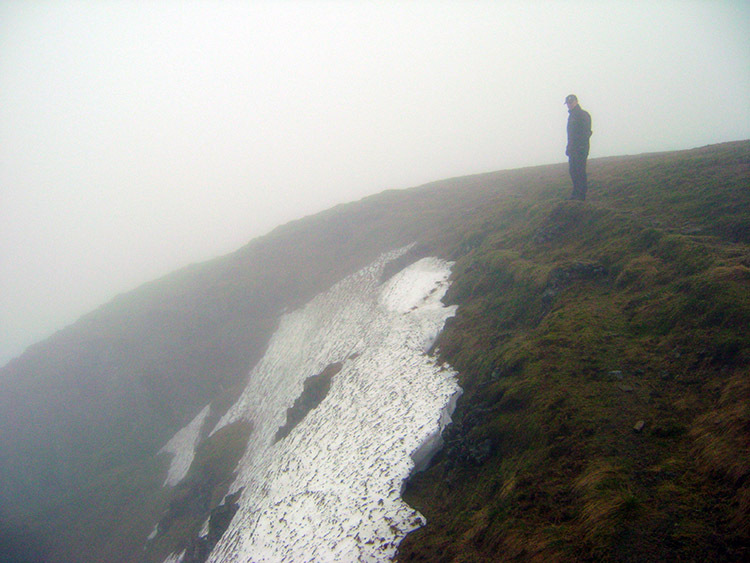 He goes on to describe the views from the summit which is useful as we did not have any on our cloud dominated morning. 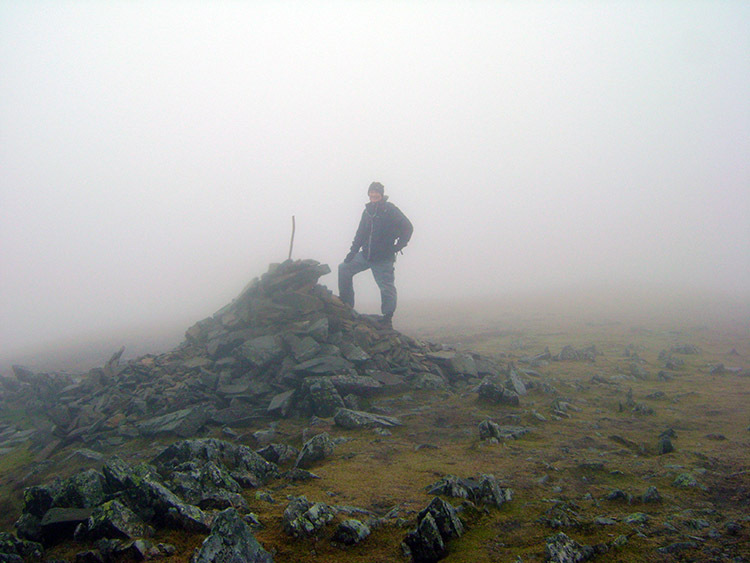 He explains that to the north Helvellyn dominates so blocks out views of the Dodds, Skiddaw and Blencathra. However, east, south and west provides lovely views of many Lake District mountain tops including Scafell Pike and The Old Man of Coniston. We rested a moment on the summit, imagined those views and then John and I looked over the eastern edge of the mountain to the abyss below. From Nethermost Pike it was an easy walk south of twenty minutes to Dollywaggon Pike. As with its northern neighbour the Pike is dominated by a steep drop on its eastern side, the western aspect from which we arrived to Nethermost Pike was much more sedate and we would use that aspect to continue from Dollywaggon Pike to Seat Sandal, our next Wainwright Fell on the itinerary. 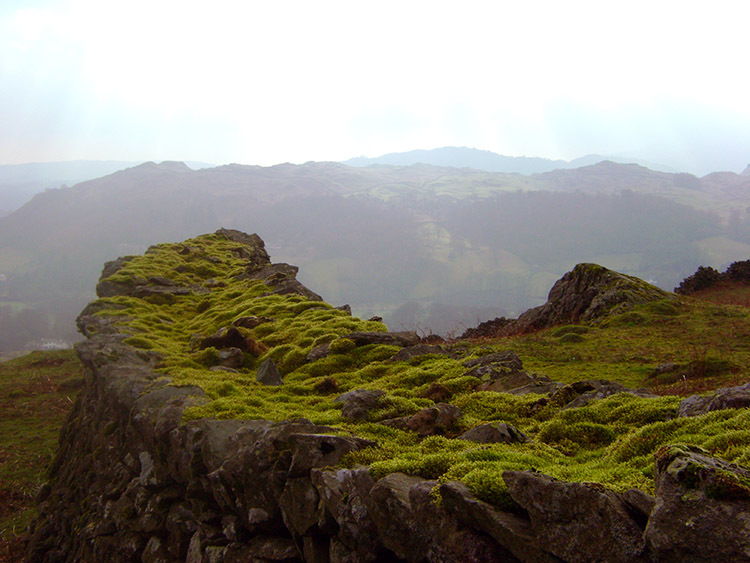 In fact, Nethermost Pike and Dollywaggon Pike are almost identical in presentation, their summits being equally flat and accommodating. 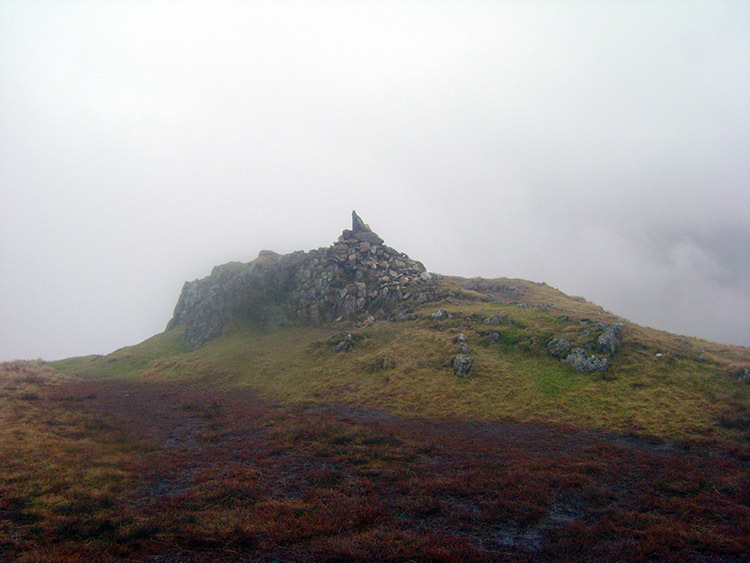 And Dollywaggon Pike has a summit view aspect almost identical to its neighbour. Anyway, we still had no view to enjoy so we moved on by descending down the western slope of Dollywaggon Pike to the west of Grisedale Tarn, a slope which was quite steep and required us to zigzag our way down. John Lister broke one of his walking poles while taking a slight stumble on the descent as it was slippery underfoot but he got safely down, albeit requiring a new pole for Patagonia. From the lowest point we made a straightforward climb to the top of Seat Sandal,a mountain well known to people in Grasmere as it dominates the eastern view over the lake. To us it was just ground below our feet in a drab sky. 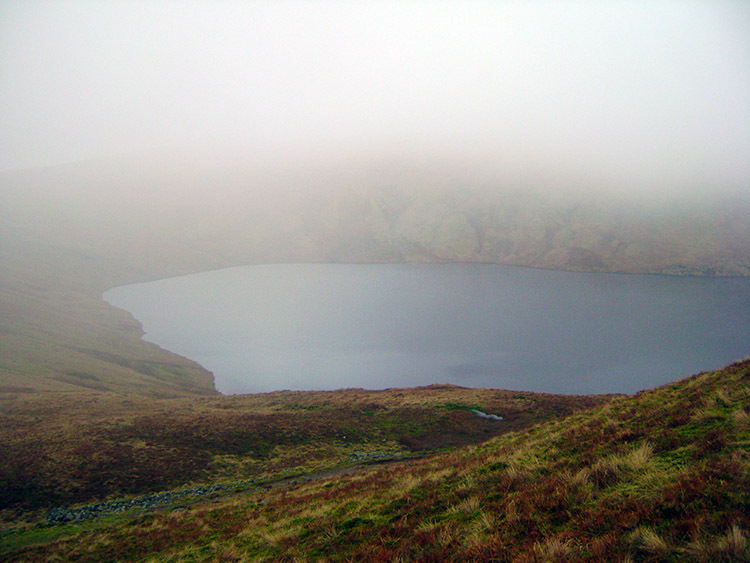 The cloud aggressively hung on so from the top we walked straight down eastwards to the low point before ascent to Fairfield and just south of Grisedale Tarn. Here we stopped for lunch. The lunch break was needed after exactly three hours walking. It was also planned as there was a tough ascent of Fairfield to follow so we took our 20 minutes out in the knowledge that all the cooling we did during inactivity would soon be replaced by the heat of the climb. And by, did we cool down for the cloud which the met office had promised would now be gone still blocked out the sun and at almost 600 metres height it was cold. As expected though, on resumption we warmed quickly as we made the steep short climb to Fairfield. 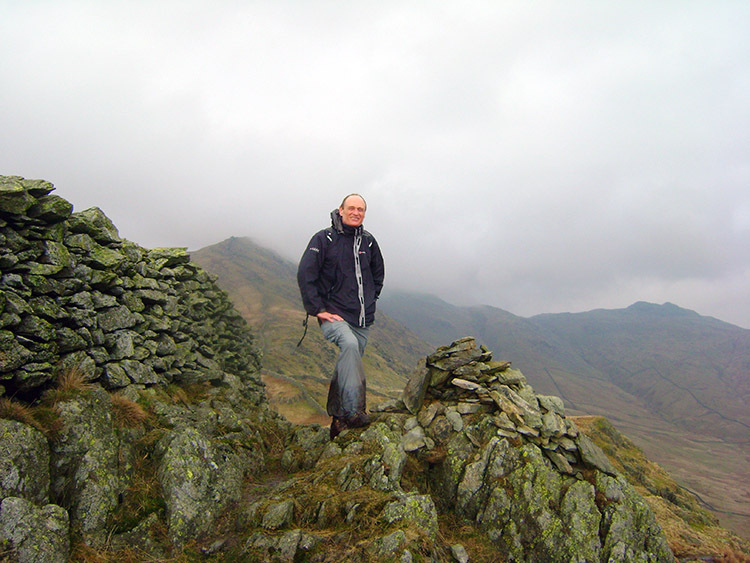 This was the third time I had made the climb to Fairfield from Grisedale Tarn and despite it being just 240 metres of ascent it rises in just one kilometer making for a stiff climb. It is one of those short sharp ascents I will always recall. John Deasey and I made the climb first with John Lister and Joanne heaving their considerable backpacks with them. Not one complaint from either of the stalwarts though, they just took the climb in their stride. 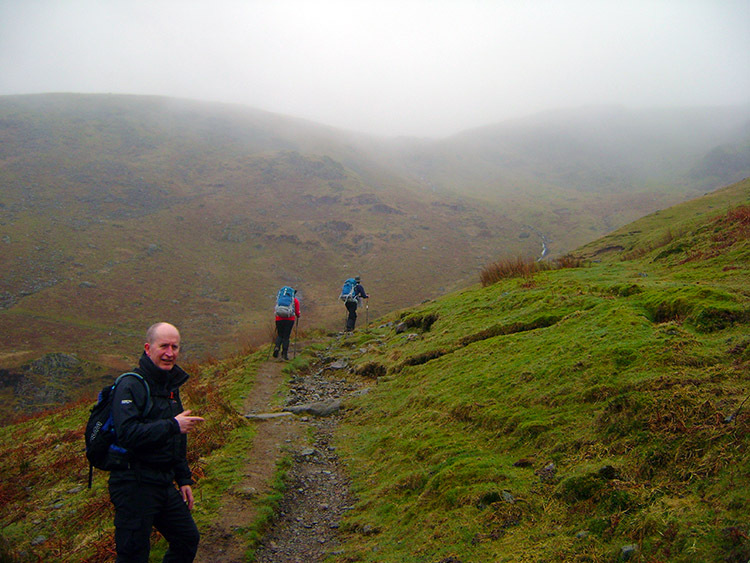 From Fairfield we then made our way towards Hart Crag, making careful progress past Link Hause. After passing Hart Crag John Deasey and I chatted some more about our love for the great outdoors and for good music. We also spoke of Neal Lever, a friend of John who had just returned from the Himalayas which included a trek to Everest Base Camp. Good on you Neal! Our much more reasonable high ground trek was now becoming a steady ramble and apart from a few uphill bumps a gradual descent. 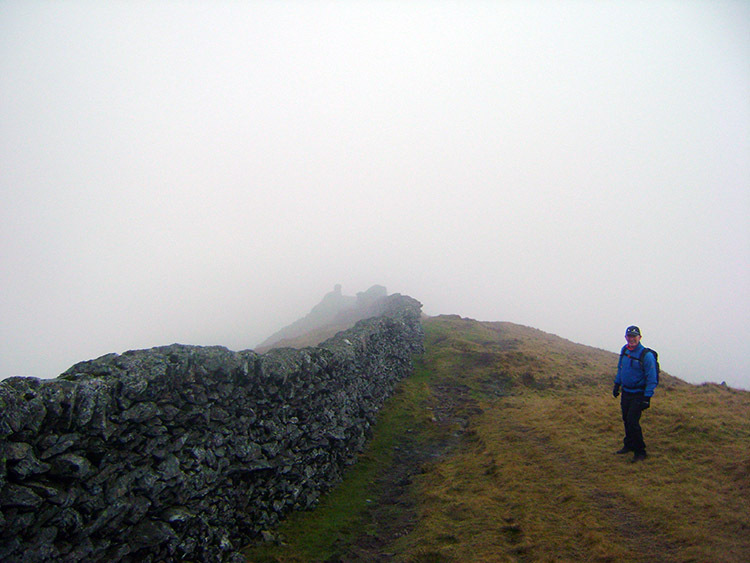 We walked past Dove Crag and then Thack Bottom Edge toward High Pike while stopping from time to time to look back through the gloom to check John and Joanne were keeping up behind. And as we made our way towards High Pike and then onwards from High Pike towards Low Pike a semblance of better visibility manifested itself. Perhaps we would still enjoy a distant views finale yet? From High Pike to Low Pike the miracle happened, the clouds lifted, pockets of blue sky appeared and the waters of Lake Windermere parted... or was that just my imagination? The might well have done, the euphoria of seeing the distant fells for the first time on the walk and the ground we had covered behind us raised my spirit markedly. 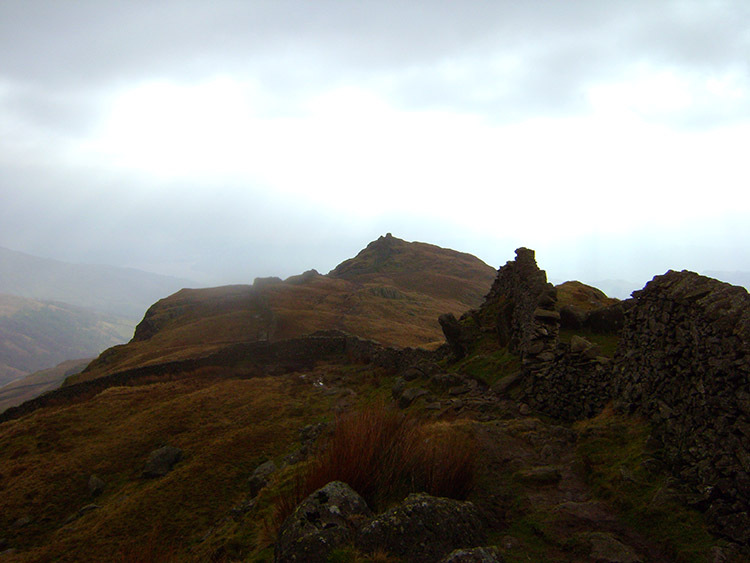 Just as the sunshine broke though we reached Low Pike, the seventh and final Wainwright Fell of a remarkable walk. 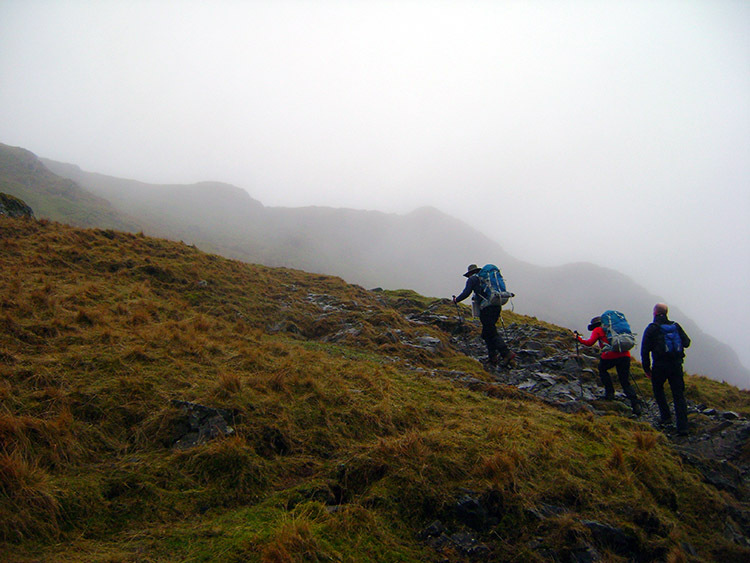 We all agreed we were so enjoying it despite the travails of the weather, it was an outstanding walk. And now the views got even better. Below us directly south was Ambleside, our finishing point. The grey buildings shimmered in the low haze heat. Beyond Lake Windermere extended into the distance. To the east Red Screes impressed with Scandale below. To the west the Coniston Fells and Langdale Fells looked grand. 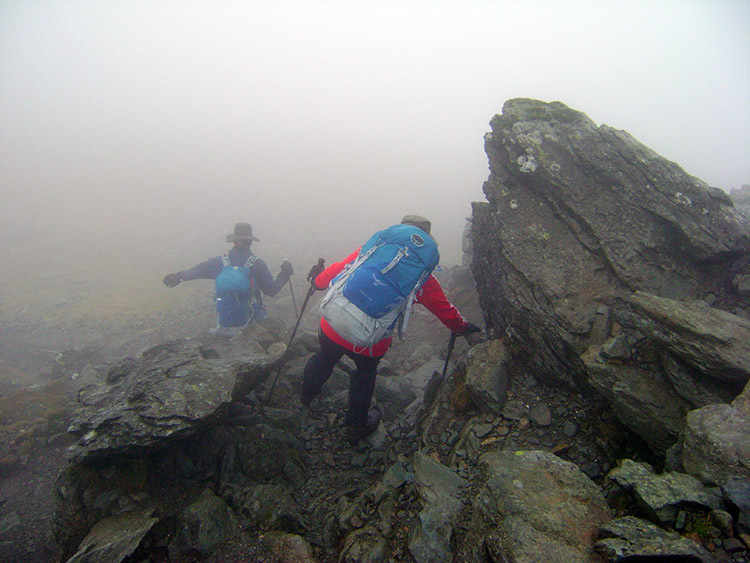 Ahead of us we had the tricky descent of High Brock Crags, Low Brock Crags and Sweden Crag. John Deasey and I found it a challenge without backpacks, John and Joanne did an exceptional job making a safe scramble through a couple of tricky sections. After the series of stepped crags the remainder of the descent was easier and soon we all came to High Sweden Coppice, a sure sign we had reached the tree line. 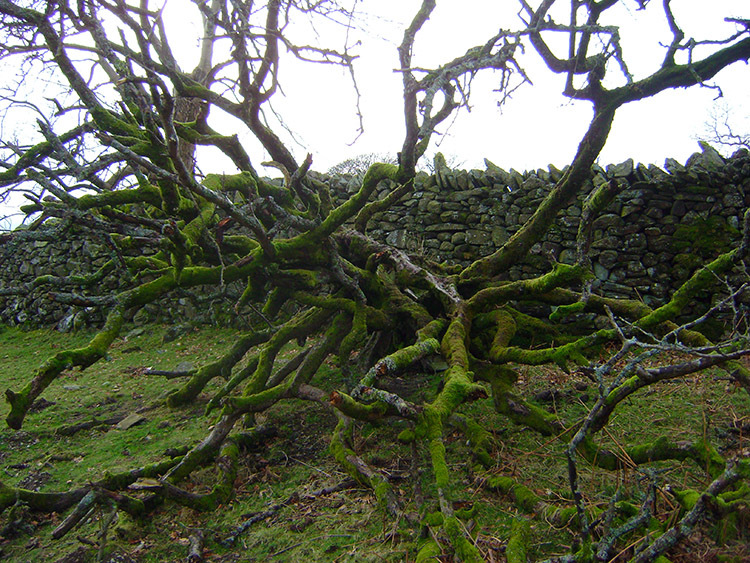 From High Sweden Coppice we walked to, naturally enough, Low Sweden Coppice and on that section I enjoyed looking at trees with interesting shapes and moss strewn dry stone walls. john Deasey noticed a line of fallen trees all in parallel to each other and we both thought why so? 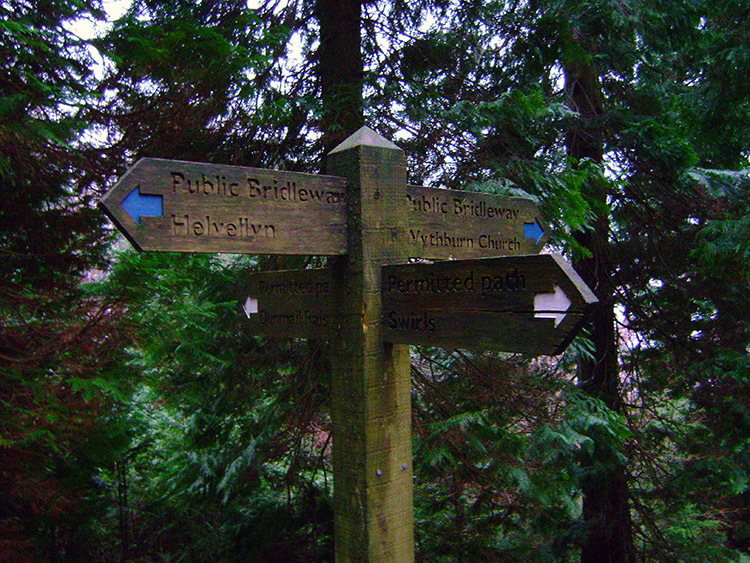 Not contriving an answer we continued on towards Ambleside. 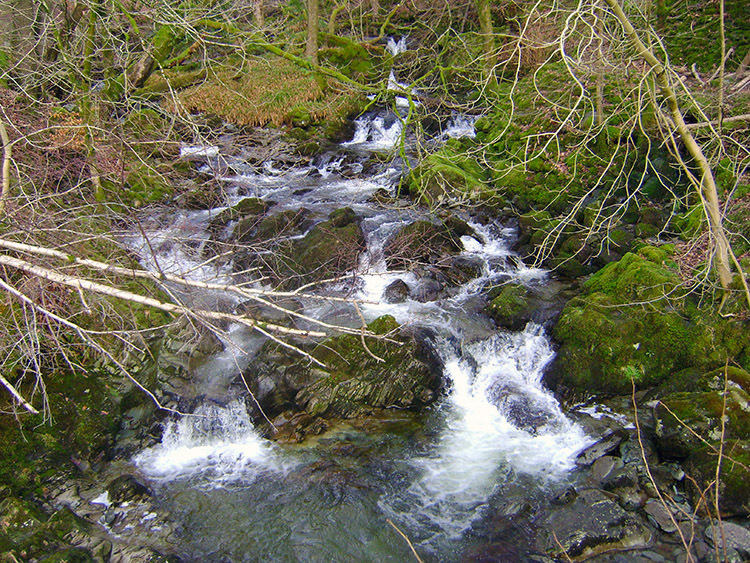 The final stretch of the walk took us across Scandale Beck at Low Sweden Bridge. From there we continued along a walled track past Nook End Farm where we all paused to watch the farmer who was accompanied by his trusty sheepdogs take out food for the sheep who were all very aware of what was happening. They ran across the field en masse and impatiently baaed for their dinner! We left them to get on with it and followed the lane into an estate which took us to the car park in Ambleside where we had left John D's car earlier. During the drive back to Wythburn to recover our other cars we all agreed the walk had been a fantastic day out and a real challenging walk. John L and Joanne also felt the walk had been very good preparation for Patagonia. Well done all, a super day's walking and most importantly fantastic company.